The first thing I saw, when I arrived on the scene of the 2018 Sweaty Yeti, was a parking lot filled to capacity. Then I noticed fat bikes. Fat bikes everywhere. More fat bikes than I had ever seen in one place. As I made my way across to the spectator area, I found people of all ages bouncing to a DJ mix. I saw reps from several Ogden area bike and gear retailers talking shop and I saw food vendors dishing up tasty looking grub. Who would have ever guessed that, just one week earlier, organizers were forced to switch venues for the Sweaty Yeti from Wolf Creek to North Fork Park in Liberty, UT. Then I noticed fat bikes. Fat bikes everywhere. More fat bikes than I had ever seen in one place. I’ve organized large events, so I was impressed by how the team had made the switch. When Toliver and the Wolf Creek Resort team made the call, the Ogden community responded by pulling together. Powder Mountain was willing to host the event but, with the limited notice, numerous obstacles and logistics were deemed too extensive. On to plan B.
Toliver reached out to Weber County Parks, who then reached out to Ogden Nordic—the non-profit group that grooms North Fork Park. Turns out North Fork Park was one of the only areas in the county that had adequate snow coverage. With Weber County and Ogden Nordic rising to the challenge, Toliver and her team pulled the trigger. From there is was a scramble getting word out to competitors, sponsors and vendors. So yes, when I arrived I expected a lower turnout. But I was stoked to find fat bikes everywhere, with upwards of 200 spectators cheering on competitors and having a grand ol’ time. While conditions were not quite optimal, racers I spoke to loved the course laid out by Ogden Nordic. The course was mostly covered with snow, but there were rutted areas that got muddier as the race wore on. But that’s where fat bikes shine, right? A bit of slop? No problem. The course consisted of a 2.8 mile loop with about 350 ft of total vertical. Check out the map here. A 40 ft. vertical hill climb at the end of the loop brought the riders right up to the spectator area—providing a nice challenge for the riders who were forced to hike-a-bike up a slippery 40 ft. hill, and providing a few humorous spectator moments. …that’s where fat bikes shine, right? A bit of slop? No problem. Beginner and Youngster groups rode two laps, while a Amateur and High School classes raced four laps, with the Pro class hammering out six laps. The high school club was well represented, along with families, male and female amateur riders of all ages and a great group in the pro class. Check out our photo gallery, and go here for the race results. Aside from the racing action, there was plenty of fun for spectators. Mercury Wheels provided complimentary beer (for adults), Daily Rise provided complimentary coffee, and Rockstar Energy provided complimentary energy drinks. Free hot cocoa and s’mores were provide by the organizers, so there was something for everyone. In my humble opinion, nothing else was needed. But there was more. Borealis Fat Bikes brought out stable of demos to ride. One of the events many heroes, Ogden Nordic, was on hand showing off their groomer and spreading the good word. I was told they are looking to step up their fat bike presence next season and planning to add fat bike-specific grooming. Hooray! 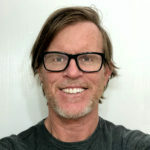 The organization is also looking to staff an advisory board, so anyone interested in helping out should visit ogdennordic.com and make contact. 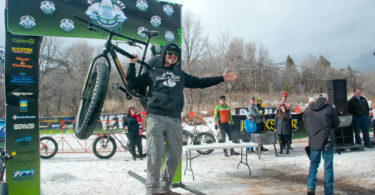 Vendors were giving out raffle tickets for a slew of great prizes, but the jewel everyone wanted was the custom Salsa Rockstar Energy fat bike. I was a bit bummed at not wining the bike, but I was brought back down to earth as I saw the winner—who says he did not have a trusty fat steed of his own—riding up and down the road after the event grinning like a cheshire cat. 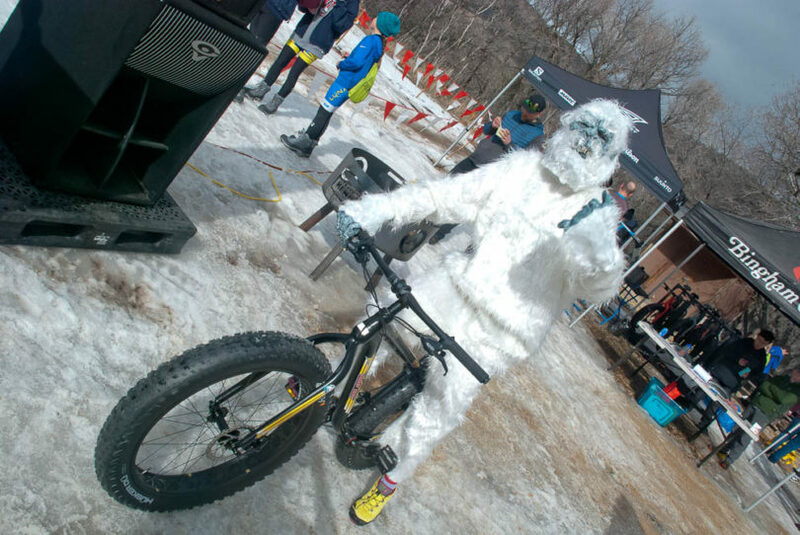 Despite the extreme lack of snow, and a last minute venue change, the 2018 Sweaty Yeti was a huge success and has arguably become Utah’s premier fat bike race. 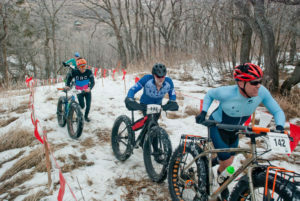 To be certain, there aren’t a lot of fat bike races anywhere. 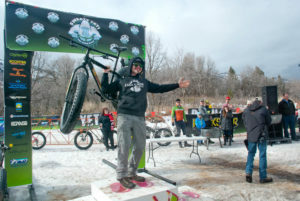 But the community of Ogden has completely gotten behind the fat bike culture and Visit Ogden—along with their partners—put on a great family-friendly event. 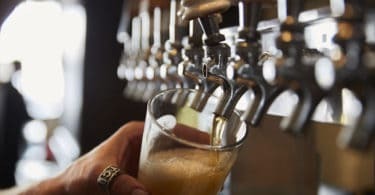 Plan on coming out for the 2019 Sweaty Yeti.